Britain's phone-hacking scandal erupted last summer after it emerged that journalists at Rupert Murdoch's News of the World routinely eavesdropped on cellphones' voicemail boxes in order to score scoops. The probe has since grown to include allegations of computer hacking and bribe-paying across the British media — and beyond. February 2010: Parliamentary committee finds no evidence that Coulson knew about phone hacking but states it's "inconceivable" that no one apart from Goodman knew about it. April 15: Judge allows actress Sienna Miller and three others to proceed with lawsuits against the newspaper despite an ongoing criminal investigation. July 7: News International shuts down the best-selling News of the World tabloid after 168 years, effective July 10. July 15: Resignations of Rebekah Brooks, the chief of News Corp.'s British operations, and Les Hinton, publisher of Dow Jones & Co. and one of Murdoch's staunchest allies. Hinton was chairman of News International during some of the time phone hacking took place. Murdoch meets with Milly Dowler's family to apologize. July 16: News Corp. apologizes in newspaper ads for "serious wrongdoing" at the News of the World. July 17: Brooks is arrested in scandal. London police chief Paul Stephenson resigns amid criticism over his alleged links to Neil Wallis, a former News of the World executive editor arrested in the scandal. Murdoch publishes another ad, titled "Putting right what's gone wrong." July 19: Murdoch appears at a parliamentary hearing alongside his son James and says he was humbled and ashamed, but accepted no responsibility for wrongdoing. James Murdoch, executive chairman of the British newspaper unit, apologizes, but denies he knew hacking was widespread at News of the World. July 21: James Murdoch's former legal adviser and a former editor contest his testimony. Aug. 24: U.S. Attorney General Eric Holder calls a report of possible phone hacking targeting 9/11 victims and their families very disturbing and says the department is pursuing a preliminary criminal investigation. Jan. 19, 2012: It's revealed that News International agreed to cash payouts to 37 people, including movie star Jude Law, who were harassed and phone-hacked by his tabloid press. Financial details of 15 of the payouts, totaling more than 640,000 pounds (about $1 million), are made public at a court hearing. Feb. 17: Following the arrests of several reporters at The Sun, Rupert Murdoch warns staff there that he won't protect reporters found to have broken the law, but he pledges unstinting support to the newspaper. Feb. 29: James Murdoch steps down as executive chairman of News International. News Corp. says Murdoch will remain its deputy chief operating officer and concentrate on expanding its television business. March 5: Reports emerge that the FBI is investigating whether a Russian billboard company once owned by News Corp. bribed local officials to get sign placements approved. The investigation grew out of the phone-hacking scandal. March 8: Britain's Press Complaints Commission, an industry-funded regulatory body that has been called weak and ineffective by victims of the scandal, confirms it is to be abolished and replaced with a new agency. March 9: Britain's communications regulator says it's monitoring the case to be sure that BSkyB is a fit and proper holder of a broadcasting license. March 14: In a letter to British parliamentarians investigating the scandal, James Murdoch reiterates that he didn't know the extent of the illegal behavior, but he says "it would have been better if I had asked more questions." April 3: James Murdoch steps down as BSkyB chairman, remains on board. April 12: The U.K.'s police watchdog says senior members of Scotland Yard showed poor judgment in their handling of the scandal. It says senior officers in the London police force broke the rules when they hired Wallis, a former tabloid executive, to help run public relations and helped Wallis's daughter get a job. April 23: The U.K. broadcast regulator says it's investigating email hacking at Sky News. April 24: James Murdoch appears before a U.K. inquiry, defends his record and accuses subordinates of preventing him from making a clean sweep at News of the World. April 25: Rupert Murdoch tells the inquiry that his globe-spanning TV and newspaper empire doesn't carry as much political sway as is often believed. Speaking softly, deliberately and with dry humor, Murdoch sought to deflate what he described as myths about his business, his agenda and his friendships with those at the pinnacle of British politics. April 26: The elder Murdoch returns to the inquiry. He seeks to portray himself as the victim, not perpetrator, of a cover-up over phone hacking. He apologizes and notes that the corporate cleanup of the scandal had cost News Corp. hundreds of millions of dollars and transformed its culture. May 1: A committee of British lawmakers calls Rupert Murdoch unfit to run his global media empire. May 2: BSkyB defends itself as a "fit and proper" company amid a regulatory review. Its CEO points out that BSkyB and News Corp. are separate companies. News Corp. controls BSkyB with a 39 percent stake. Meanwhile, News Corp.'s board of directors announces it has "full confidence in Rupert Murdoch's fitness." May 10: Coulson appears at the media ethics inquiry and denies that he got the job to boost Cameron's clout with Rupert Murdoch's powerful media empire. May 11: Brooks testifies and reveals that Cameron commiserated with her after she quit. She also acknowledged that she used her access to lobby the British government over the BSkyB takeover deal. May 15: Brooks, her husband and four others are charged over alleged attempts to conceal evidence. The criminal charges are the first to be filed since police launched a new inquiry in January 2011. May 30: Coulson is arrested and charged with perjury in the trial of a flamboyant ex-Scottish lawmaker. June 1: A lawyer for News Corp.'s British newspaper group says the company could face 500 lawsuits from victims of phone hacking — far more than have so far been filed. June 11: Brown, the former British prime minister, accuses a Murdoch-owned tabloid of personally attacking him, failing the British people and undermining the war in Afghanistan through its coverage of the conflict. The remarks come at Britain's media ethics inquiry. June 12: Former British Prime Minister John Major testifies that Murdoch tried to influence his government's dealings with the European Union, even hinting that the politician could lose the support of Murdoch's newspapers if he didn't change direction. June 14: Cameron defends his ill-fated decision to make Coulson his communications director. Cameron says he had received assurances that Coulson was not involved in the phone hacking — but those proved hollow when Coulson was forced to resign last year in the scandal. June 18: News Corp. says former U.S. Assistant Attorney General Joel Klein is relinquishing his role as head of the company's internal probe into phone hacking. He surrenders the duties to Gerson Zweifach, a company lawyer. News Corp. said the move allows Klein to return to his full-time job running its education division. June 22: Brooks is granted bail until Sept. 26 as she awaits trial on charges of attempting to cover up evidence. 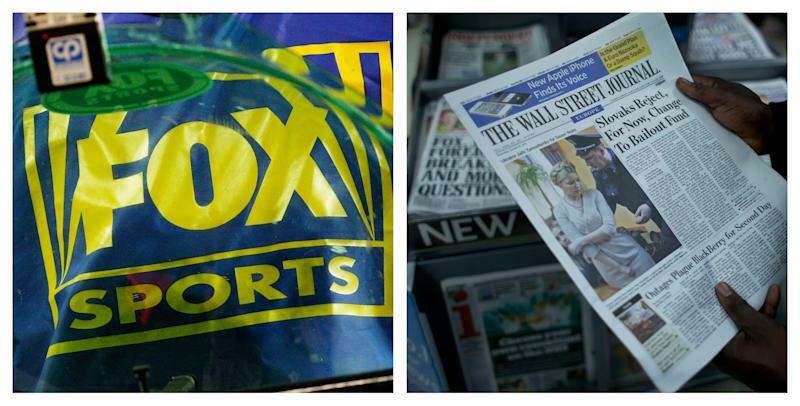 June 28: News Corp. says it plans to split into two companies, one holding its newspaper business and another its entertainment operations. Both will be publicly traded. It may take a year to work out the details. July 23: A senior Scotland Yard official says British police are investigating new tabloids, including competitors to News of the World. Officials are combing through electronic information to look for evidence for more than 100 claims of "data intrusion" — a category that includes computer hacking and improper access to medical records. July 24: British authorities charge Coulson, Brooks and six others, accusing them of key roles in a campaign of illegal espionage that victimized hundreds of people including top celebrities Angelina Jolie and Brad Pitt. Aug. 15: News Corp. says Zweifach is the new chief compliance officer, in charge of a review of the company's anti-corruption controls. Murdoch tells staff that the review "is not based on any suspicion of wrongdoing" but rather "a forward-looking review" meant to improve its ethics procedures. Thursday: In a speech, Rupert Murdoch's daughter Elisabeth says Britain's phone-hacking scandal has highlighted the need for a rigorous set of values in the media, while prompting some serious soul-searching at her father's company, News Corp.